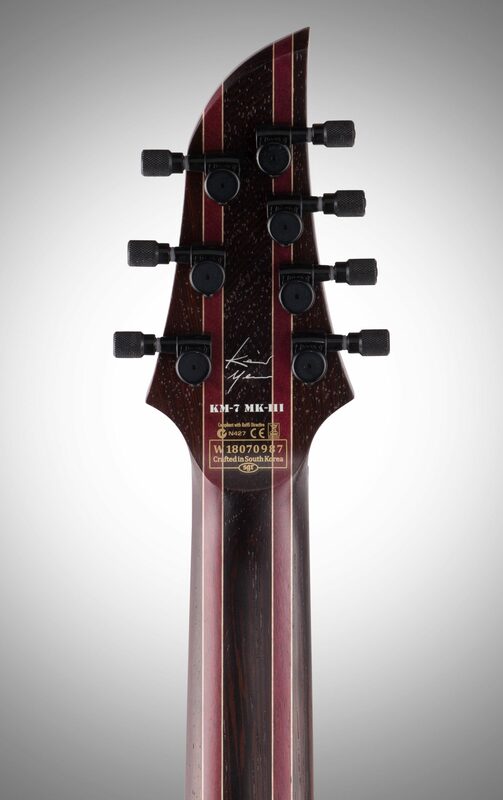 Precision-crafted to meet the demands of one of today's most influential artists, Keith Merrow, the new KM-7 MK-III Artist from Schecter Guitars is built from the ground-up to be the best possible guitar for high-octane 7-string fretwork! 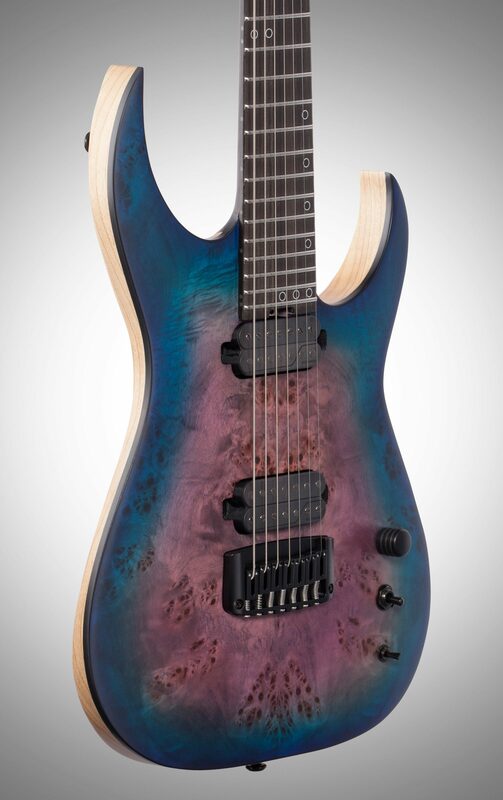 Swamp Ash body wings combine with a carbon fiber-reinforced 9-ply Wenge/Maple/Purpleheart thru-neck capped with a 26.5" scale ebony fingerboard to deliver clear, resonant tone and a fast, smooth feel in your hand, while a Poplar Burl top offers up a stunning visual presentation that commands attention. Ensuring that the KM-7 MK-III Artist brings the goods on all levels, the guitar comes factory-equipped with premium appointments including an Ernie Ball compensated nut, Hipshot High-Mass bridge, Hipshot Grip-Lock tuning machines, Fishman Fluence Keith Merrow Signature pickups with dual-voice and coil-split switching, and a solid brass string mounting block. Available in your choice of Transparent Black Burst or Blue Crimson finishes, both featuring a contrasting natural-finish back and sides. SGR-1C molded case sold separately. - Neck Shape: Ultra Thin "KM"
This review has been selected by our experts as particularly helpful. "Perfect except for only one thing"
Sound: Very good sound quality. Responds very well for my playing styles. Very compatible with my style of music. Feature: The most useful feature in my experience is the way the guitar plays. The feel of it matched with the fishman pickups is really outstanding. The least useful feature by far would be the strap button located on the inside of the top horn. It's simply a poor design in my experience. Allowing the guitar to feel unbalanced/uncomfortable when using while standing. Ease of Use: Very easy to get great sounds from this model. Very playable and easy to use. A learning curve may not pertain to this instrument unless unfamiliar with a more advanced guitar model. Quality: It seems to be made quite well. Seems reliable at least at the moment in the studio. Holds tuning well. I'm tuning to drop G# and i didn't even have to adjust the intonation. Seems like it could last 20-30+ years or longer if treated and cared for properly. As with any instrument. Value: Yes I believe it is. The price point for this model, and for the craftsmanship are indeed comparable. 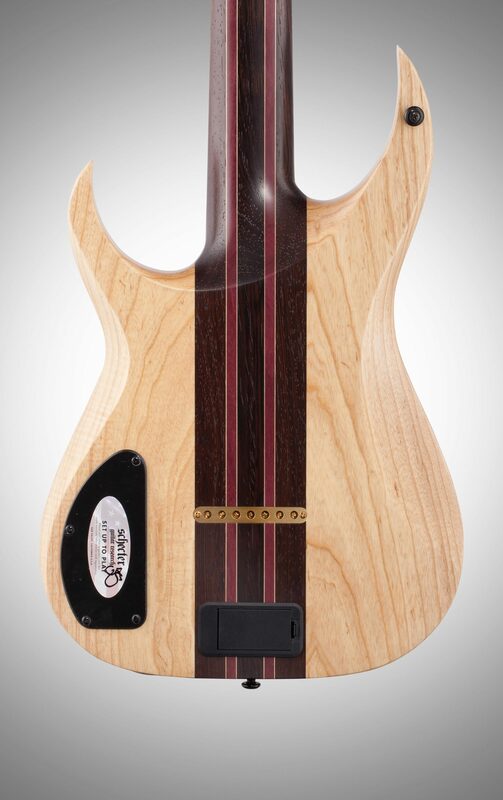 Manufacturer Support: I did reach out the Schecter custom shop in an attempt to possibly get the strap button reattached in the "proper" location. I left a message and Matthew D called me back about 20 minutes or so later. He was very friendly but unfortunately Schecter wasn't able to honor my request. 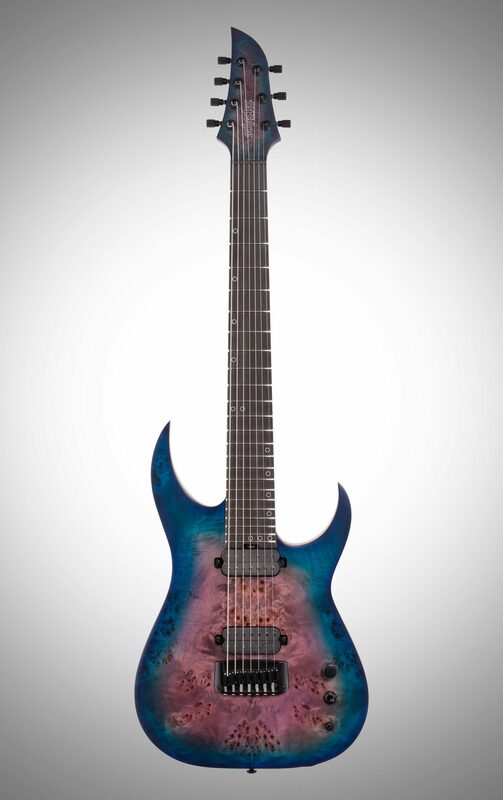 The Wow Factor: I have one each from the Schecter Keith Merrow line. The first one was really nice. The second one was a bit better.. 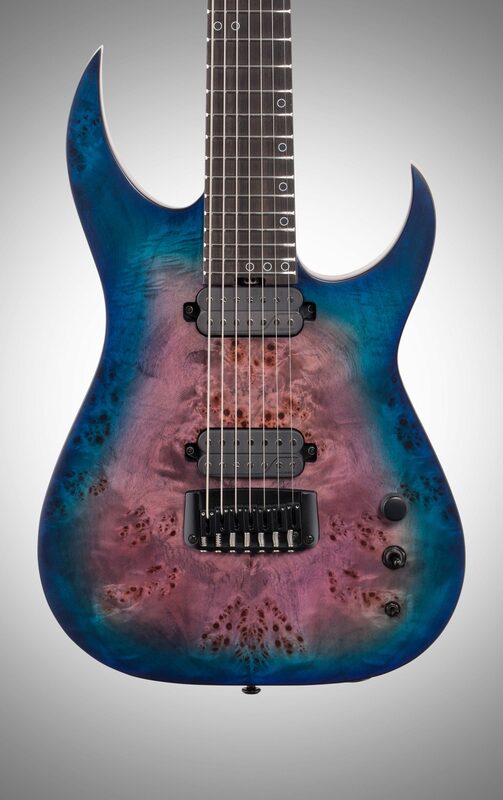 But this one minus the aforementioned is really a cut above in terms of overall craftsmanship, pickups, playability and just all around look/feel of this model. It's the best guitar i have ever played! 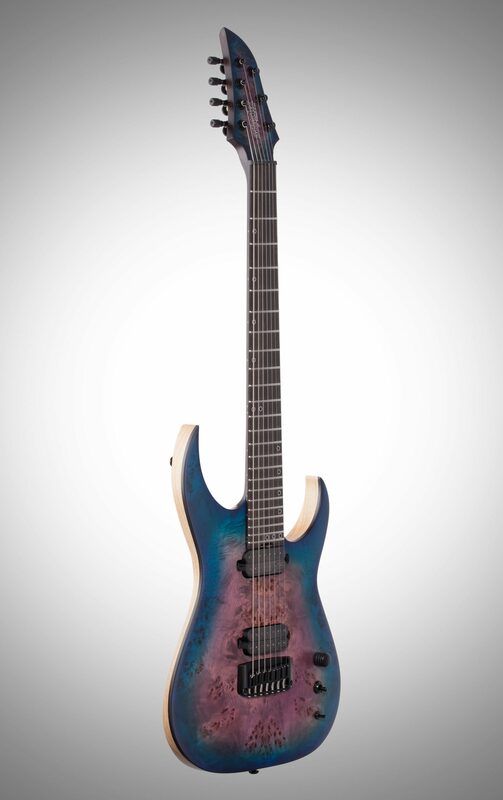 I would love to be a Schecter artist at some point in my future! Overall: This guitar is perfect in every way except where the upper strap button is located. 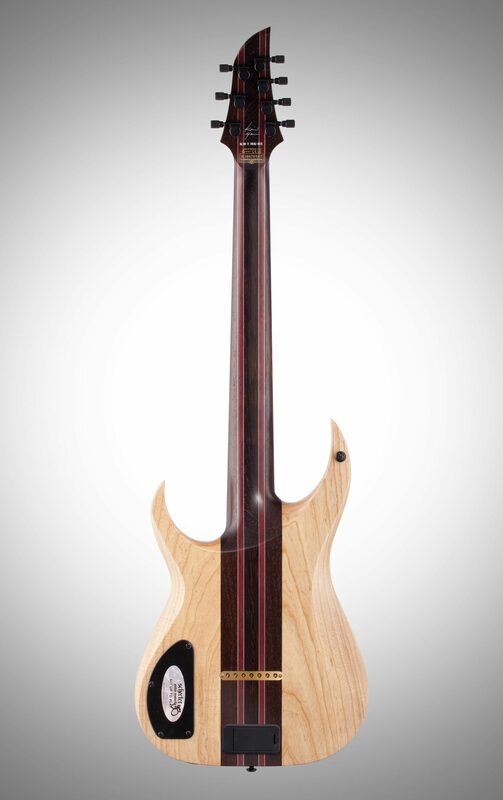 It's located on the inside of the top horn and unfortunately allows the guitar to be head stock heavy while wearing it with a strap and while standing. The Fishman pickups sound just phenomenal. With as many as 9 different sound configurations. These pickups designed with the help of Keith Merrow, will really help shape your sound just the way you want it.. Versatile and professional sound. The body is really sharp, sleek and looks awesome. The neck is quite thin and allows for super fast runs and a silky smooth feel. The tuners are great as well. Right out of the box it was setup just the way i like my guitars to be. Overall I would buy another one. Just that strap button is not a good design in my opinion. Style of Music: I play mostly metal. A touch of classical and some songs with a mellower vibe. 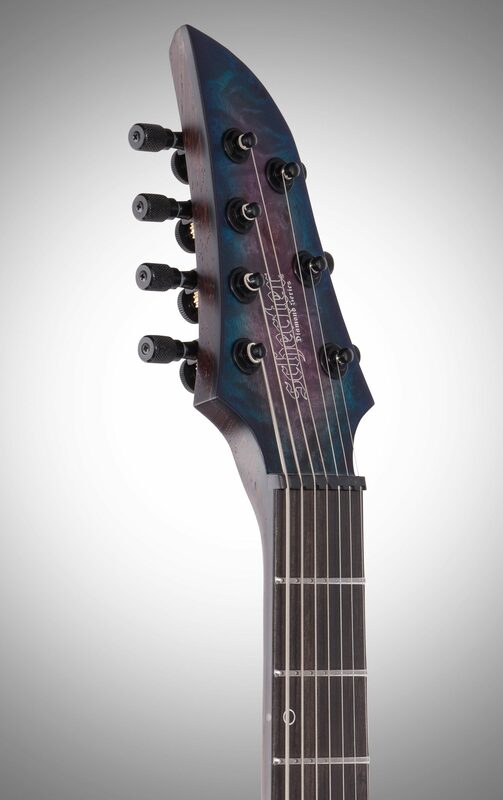 Overall: This guitar is awesome. It is so good it made me realize flaws with my other guitars lol. The Fishman pickups sound amazing playing anything from metal to clean tones. If you are on the fence because of the price, do it. You won't be sorry. It's worth every penny to me.